GeoImgr is a simple web tool for geotagging photos. JPG photos can contain geo location information saved in the EXIF header of the image file. Easily geotag photos with new coordinates. Find the location where a photo has been taken. Works for all photos taken by smartphones with geotagging enabled. 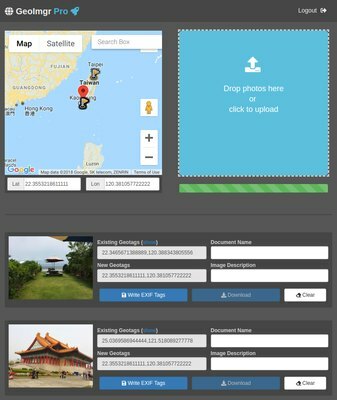 Geotag images to improve the search engine ranking for location-specific websites and businesses. Bulk upload and geotag photos of field inspections. No installation required. GeoImgr is up and running for over 10 years now and has been continously improved. Contact us at info@geoimgr.com. We will answer every email usually within 24 hours or quicker.